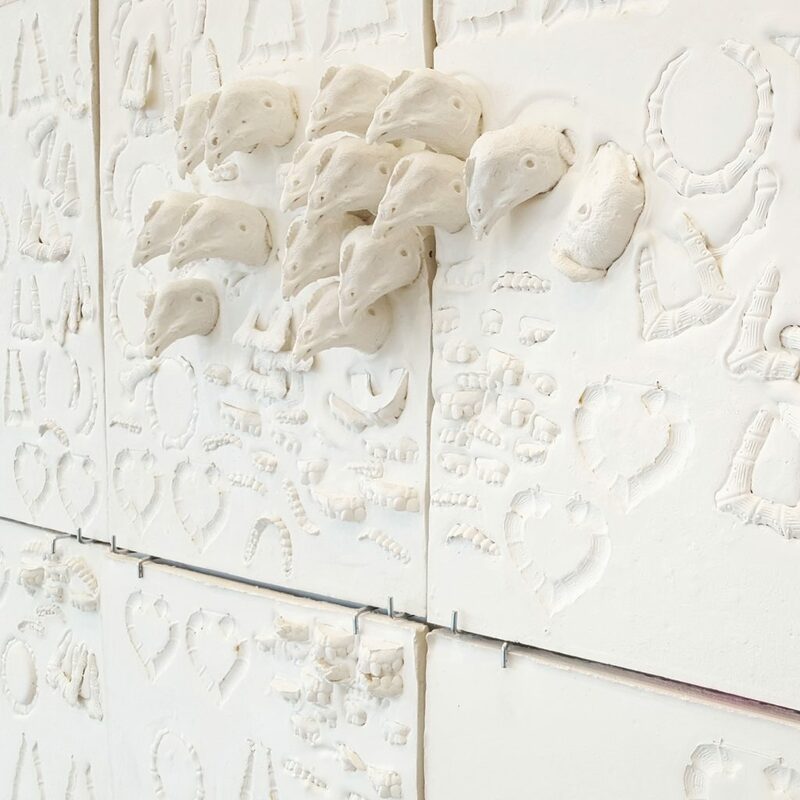 BIRMINGHAM, Mich. — It’s almost possible to consider Material Relief, the collection of plaster-cast works by Brooklyn-based artist LaKela Brown currently on display at Reyes Projects, as an exercise in abstract mark-making. The formal repetition of shapes cast into and out of stark white plaster is so evocative of ancient art forms, like cuneiform tablets or hieroglyphic wall carvings, that, from a small distance, they translate easily into an abstract visual language. But upon closer examination, it becomes clear that Brown, a Detroit native, has not chosen these shapes arbitrarily or plucked them from ancient history. They are the common trappings and symbols of a 1990s hip hop-flavored upbringing: door-knocker earrings, prosthetic teeth, and rope chain. Not to put too fine a point on it, Brown has punctuated several of the works with clusters of relief castings of actual chicken heads — “chickenhead” being derisive hood slang for a dumb female, or one who likes to give head. There is something powerful in encountering these former status-markers, now mostly seen as throwback fashion, stripped of their initial use value or a sense of interpersonal communication, and presented in the form of bas-relief. A statement accompanying the work characterizes these pieces as memorials for wider concepts within American hip hop culture — aspirations of wealth, for example — but the original materials all came from the artist’s personal archives. Brown has spent quite some time meditating on these themes, as far back as Bamboo Earrings, At Least Two Pair, presented at Detroit’s CAVE Gallery in 2016. It is arguable that the desire to recast and literally re-contextualize the objects within the fine art space reveals a yearning on her part to find a place for these aesthetically cherished objects that confers a different status upon them: a place where a woman is perhaps allowed to wear the jewelry she wants, without it leading to intrusive implications about her sexuality.